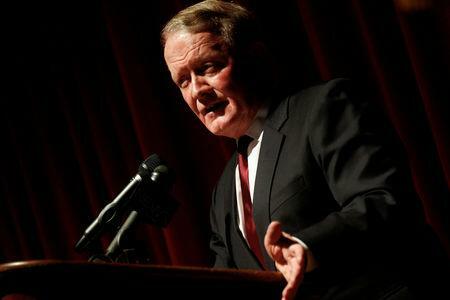 STOCKTON, N.J. (Reuters) - Leonard Lance is a Republican congressman seeking re-election in a Republican district. But he has little to say about the Republican president. Lance’s campaign website, which outlines his positions on immigration, taxes and other hot issues, offers no statement of support for President Donald Trump. On his Twitter and Facebook accounts, Lance has offered no plaudits this year for the president. When he does reference Trump, he’s more likely to note their differences. He’s co-sponsored bipartisan legislation to restrict the president’s power to impose tariffs on imports and to require reunification of immigrant children and parents separated after being caught crossing the southern border. He’s also touted his support for gun control. Yet Lance’s approach also reflects a broader reality. November’s congressional elections are widely viewed as a referendum on the president, and in the well-heeled, reliably Republican suburbs in North Jersey where Lance is running, there’s not a lot of love for Donald Trump. It’s a challenge faced by Republican candidates in similar districts nationwide who are trying to capture the moderate-to-conservative voters they need to win. Perched in the outer ring of the New York City suburbs, New Jersey’s 7th Congressional District has been a Republican stronghold for three decades. It’s an enclave of white, wealthy, well-educated voters where the median household income exceeds $100,000 and nearly three-quarters of adult residents have attended college. The 7th is typical of the higher-income, generally suburban districts that are battlegrounds in the fight to win control of the U.S. House of Representatives this November. Trump largely enjoys strong support within his party: Reuters/Ipsos opinion polls put him at 82 percent approval among Republican likely voters. But that backing softens among Republicans with college degrees and higher incomes. In 2016, he ran poorly in many districts where those voters hold sway. Some disenchanted Republicans take issue with Trump’s policies, particularly on immigration, the environment and U.S.-Russia relations, polling shows. More often, they condemn the president for being divisive and disrespectful. Now, with polls and analysts favoring Democrats to win the House majority, battleground Republicans need every vote. And few questions loom larger than how closely they should align themselves with the president. The answer for many: keep quiet. The trend is particularly profound in the 10 wealthiest of those battlegrounds. Just four of the Republican candidates in those districts have supported Trump on their websites or social media accounts. In the 10 battlegrounds with the lowest median incomes, eight of the Republican candidates have expressed support for him. The Reuters analysis provides a measure of how many Republican candidates in battleground races are trying to steer clear of the president. Anecdotal reporting has shown some distancing themselves from Trump, but there has been no clear picture until now of how often this is happening. Reuters analyzed dozens of campaign websites and thousands of social media posts of candidates in battleground races. The analysis shows how the Republican Party’s battleground candidates are handling competing pressures: a Republican base that shuns candidates who criticize Trump, and moderates and independents who want legislators to stand up to him. Among the incumbent Republicans who are running silent on Trump, most have backed the bulk of his legislative priorities. But they are not touting that support. It’s a delicate balancing act. Trump has campaigned in support of a dozen House candidates since early August, including several in battleground districts with more modest household incomes. He plans additional events for House candidates in the weeks ahead. In an Oct. 1 memo, White House political director Bill Stepien warned that Republican candidates who don’t embrace the president won’t capitalize on the zeal he generates among people who like the country’s direction. Noting that Republicans are “lagging in enthusiasm” for the party’s congressional candidates, Stepien hailed Trump’s ability to “turn out new and unlikely voters.” To win, he added, candidates must “closely, clearly and boldly align themselves” with the president and his policies. The memo, which was reviewed by Reuters, was first reported Tuesday by the New York Times. The White House declined to comment. Leonard Lance is the latest in a string of Republicans who have held New Jersey’s 7th District congressional seat since the 1980s. It’s a success built on steady support from an electorate heavy on white collar professionals who favor moderate, fiscally conservative candidates. This year, some of those constituents, including even a few local Republican officials, are applying a new litmus test for their vote: They want a candidate who opposes Trump. “There’s nothing presidential about him,” says Michelle Garay, the Republican mayor of Alexandria, a small township in the district. Garay, a retired industrial scientist and first-time elected official, finds Trump’s views “extreme” on everything from immigration to environmental regulation. “There’s very little I can find where I agree with him.” This year, Garay says, she’s backing Lance’s Democratic opponent, Tom Malinowski, a former State Department official in the Obama administration. Nic Messina, a Republican official in the nearby borough of Stockton, shares similar views. “Republicans are not standing up for their true values,” says Messina, president of the borough’s governing council. He once appeared on a political flier with Lance and is seeking reelection this year as a Republican. But he plans to vote Democrat in the congressional race because he wants “more active opposition” to Trump. Most of this year’s 56 battleground seats, like New Jersey’s 7th, already are in Republican hands. Just five have Democratic incumbents. In many of the Republican-held districts, the Trump effect on voters like Garay and Messina has made it tougher to navigate a path to victory. Reuters identified a district as a battleground when three independent political analysis groups – Cook Political Report, Inside Elections and the University of Virginia’s Center for Politics – agreed the race was competitive or leaning against the incumbent party. Trump won in 34 of those 56 districts in 2016, but his victories were concentrated in areas with lower incomes. He won more than 75 percent of the battleground districts with median incomes below $75,000; he won fewer than 20 percent of those with median incomes above $75,000. Trump also fared slightly worse in districts with high percentages of college-educated voters – a demographic that typically correlates with higher incomes. Polling suggests Trump remains a harder sell with those constituencies. Among Republicans with college degrees and household incomes of $75,000 or more, 51 percent said over the last month they are “certain” to vote in the upcoming congressional elections, down 9 points from 2014, Reuters/Ipsos polling shows. In battleground districts, races can be decided by a handful of votes. Republican Party officials recognize that some candidates face a dilemma in how to handle the president. And they are letting them steer their own course. Six-term Representative Peter Roskam has a good sense of how voters in Illinois’ 6th Congressional District feel about the president. Despite re-electing the Republican congressman in 2016, they backed Democratic presidential candidate Hillary Clinton over Trump by nearly 7 percentage points. The district typifies the battlegrounds where Republican candidates face anti-Trump headwinds: a fast-growing suburb west of Chicago with a median income near $100,000. Roskam has made no statements of support for Trump on his website or in posts this year to his social media accounts. He acknowledges that associating himself with the president might do more harm than good. Having Trump campaign for him in the district “obviously wouldn’t be helpful,” he said in an interview. Roskam has criticized Trump’s tariffs on imported goods and has decried the administration’s separation of immigrant children from parents. After Trump held a July press conference with Russian President Vladimir Putin and refused to condemn Putin for interference in the 2016 U.S. elections, Roskam called Trump’s performance "an affront to American democracy." But Roskam notes that he also backs the president on issues important to pro-Trump voters, such as raising military spending and lowering taxes. In an August tweet, Roskam described as “absurd” a statement by his Democratic opponent comparing Trump with al Qaeda founder Osama bin Laden. “This district is discerning,” Roskam said, and voters want a candidate who will represent their interests independent of the president. But Roskam's reluctance to embrace Trump isn’t enough for some of the anti-Trump Republicans he’s trying to capture. “Peter Roskam has distanced himself from Trump, but he doesn’t stand up to him,” said Bill Wentz, 73, a lifelong Republican and former federal government lawyer. Roskam hasn’t done enough to fight the president on economic policies that Wentz says undermine traditional Republican support for free markets by picking “winners and losers.” He also is uncomfortable with Trump’s failure to fully embrace U.S. intelligence agencies’ finding that Russia interfered in the 2016 U.S. elections. Wentz’s answer: vote for Roskam’s Democratic opponent, Sean Casten. Reuters/Ipsos polling suggests the number of Republicans who are so turned off that they are likely to stay home is relatively small. Among moderate, registered Republicans with college degrees and incomes of $75,000 or more - a group somewhat less supportive of Trump than other Republicans - less than 1 percent say they don’t plan to vote. The bigger threat is the 14 percent in that Republican demographic who, like Wentz in Illinois, say they will back a Democrat or a third-party candidate. Robert Ellis, 75, a Republican businessman in Nevada’s 3rd Congressional District, is among them. A regular Republican donor, Ellis is put off by Trump’s anti-immigrant rhetoric and divisive tweets. So, he’s not backing Republican nominee Danny Tarkanian, a fervent Trump backer, in the battleground race outside Las Vegas. Instead, Ellis says, he’s throwing his financial support and his vote to Democratic candidate Susie Lee, hoping Democrats can win the House and provide a check on Trump. Lance, the Republican candidate in New Jersey’s 7th district, is seeking that elusive middle ground. Lance says he backs the president on issues such as fighting Islamic State and standing tough against Iran’s nuclear weapons program. But he’s quick to tick off examples of his differences with the president. He notes he was among just 12 House Republicans to oppose the Trump-backed tax reform act, which limits local and state tax deductions that are popular in New Jersey. It’s a nuanced approach in a district where anti-Trump sentiment runs high. In 2016, Lance won handily even though the district voted narrowly for Clinton in the presidential race. Garay and Messina, the two Republican officials who plan to vote Democrat in this year’s congressional race, want a candidate who will work against the president. Both say plenty of Republicans in the district share their frustration with Trump, but they expect many will stick with the party’s congressional candidate. “There are people who say, ‘I’m a Republican and I will never vote for a Democrat, no matter what,’” Garay says. Raised in a Republican family that favored conservative icon Barry Goldwater, Garay fiercely opposed Clinton in 2016. But her discomfort with Trump drove her to vote for a third-party candidate.